In between BlogPodium preparations and basement renovations at our house, I've been helping my sister with a few projects at her place. More on that later, but here's one little area I think turned out really sweet. This is her mudroom/laundry room. Its a bit of a traffic zone, with doors leading to the backyard, garage, and front of the house. 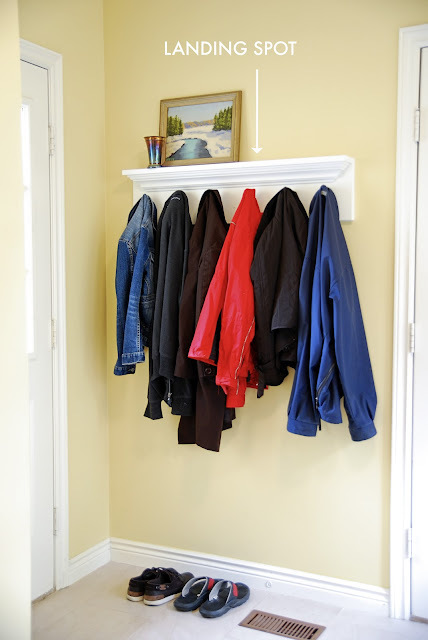 She used to have an wall-mounted metal rack here, with a big shelf on top that was always overflowing with hats and scarves, and hooks burdened with bags and coats that never ever looked neat or organized. I suggested she have her carpenter make a simple coat rack with some black hooks and a shelf made out of crown moulding. Now everything looks nice and neat and there is a landing spot for keys and even some pretty artwork. A small simple change that works. Love it. The coat rack looks great!